Victoria Arana started working at a cannabis dispensary in Los Angeles when she was 18 years old. She and most of her young, all-female coworkers worked ten- to 15-hour shifts, five to seven days a week. They weren’t allowed to keep their tips, weren’t paid for their last hour of work (in which they did the clean-up), and were subject to sexual harassment and wanton disrespect from the male owners, she recalled. Management was constantly crossing boundaries, she added, even trying to kiss coworkers on multiple occasions. Exacerbating the situation was the fact that the defunct shop—located in the now-gentrified Silver Lake neighborhood—was locked down like a prison by virtue of its dubious legal status in the era preceding full legalization. According to interviews done over the past few years with veterans of the cannabis industry, Arana’s working conditions were not uncommon. The question is whether and to what extent they will linger as businesses across the country transition from an unlicensed or gray market to a regulated, legal one. That’s where the labor movement comes in. As full pot legalization spreads, labor organizations like the United Food and Commercial Workers Union (UFCW)—which represents 1.3 million people across multiple fields, from grocery store workers to meatpackers—are seizing on the nascent industry. The UFCW already claims tens of thousands of cannabis workers across the US: In August of last year, Seattle-based dispensary chain Have a Heart inked the state’s first collective bargaining agreement between a recreational cannabis shop and the union. In 2017 in Minnesota, a cannabis production facility and chain of dispensaries struck a deal with the local UFCW. And in New York in 2016, the first union agreement for medical marijuana businesses was established in advance of the seemingly inevitable legalization of recreational use by adults in the state. Other labor organizations, such as the Teamsters, have made inroads to the industry as well. Although it might not seem like it fits squarely in the union’s purview, there are segments of the supply chain—such as cultivation, which has its own legacy of poor working conditions, especially for women—Teamsters have been vying for, beginning in 2010 when their Oakland, California, local organized the country’s first group of marijuana cultivators. The United Farm Workers of America (UFW) is also considering tapping into the newly legal industry: While the union doesn’t have any cannabis members yet, it was “engaging workers in a number of key cultivation regions” given that a bulk of the licensed grow sites in California are in regions where UFW already has a strong presence and deep history, Jamie Padilla, UFW cannabis campaign coordinator, said in an email. All of which is to say that as an increasing number of states legalize medical and recreational cannabis, the potential for unionization has grown with the volume of pot sold—and could usher in a sea-change in the way the cannabis industry does business. But experts said it could also help bolster the strength of the labor movement as a whole even as it faces historic headwinds under a hostile Supreme Court. Unionizing cannabis workers will help improve working conditions for those in it, but also help grow an industry that provides an alternative living to the increasingly popular “gig economy” and jobs like driving for Uber, argued Rigo Valdez, vice president and director of organizing for UFCW 770 in Southern California. UFCW 770 has been working with select medical marijuana shops in Los Angeles and beyond since before recreational weed was legalized, but the local union—which also represents cosmetologists, pharmacists, and more—significantly ramped up efforts in 2018. Methodically making their way through the Southern California cannabis supply chain, organizers said, they’ve worked with retail, cultivation, manufacturing, and delivery workers to amass approximately 700 cannabis union members from Santa Barbara through the South Bay. Jonathan Fabro is one such card-carrying member, currently working as a bud-tender at LA Wonderland Caregivers dispensary, a union shop. He secured his first job in the industry at the age of 20 when a spot he frequented announced they were hiring, he recalled. But after working there less than a year, the store was taken over by new ownership; Fabro was kept on to train the new staff, he said, only to be fired soon after. When he got hired at Wonderland and learned it was a union gig, “I was like, ‘Union, what’s that?’” he told me, in what seemed like a perfect encapsulation of the decline of organized labor in the popular imagination. Fabro quickly learned of its benefits though, like the easing of the “constant backdrop of anxiety” that had seemed endemic to his work. He no longer felt like he had to do everything “above and beyond” his job description in order to avoid getting fired, and said he viewed the union as a security net that safeguards him from working for free or under dangerous conditions. UFCW 770 has focused much of their initial efforts on larger pot shops, such as cannabis company MedMen, which has eight dispensary locations in California alone. It’s these substantial operations that have a bit more stability and capacity to provide living wages, Valdez argued . They also help set a strong precedent for other shops to follow suit and can impact wide swaths of workers in one fell swoop. Current priorities for the UFCW include ensuring cannabis workers operate in safe conditions, have a sense of job security, and are paid a fair wage, organizers said. In fact, many longtime employees have often not been paid at all—instead, they got compensated with weed. Meanwhile, as a growing number of both medical and recreational cannabis shops unionize across the country, organizers and experts touted benefits not-only for members but for the strength of organized labor as a force in culture and politics. “There’s some evidence that success breeds success,” David Zonderman, a professor of history at North Carolina State University, said. If a major organizing campaign takes off within the cannabis industry, he explained, its success could encourage other industries to organize as well. However, the difficulty of organizing—even in liberal states where unions are strong—remains real. There’s been no shortage of inspiration from highly publicized acts of resistance, however. Take the strike this month by the United Teachers Los Angeles (UTLA): This was only the third time in the union’s 50-year-history that teachers struck, the most recent demonstration prior having been in 1989. The teachers prevailed on both occasions, and this year, secured improvements such as salary increases, reductions in class sizes and obtaining a full-time nurse in every school. 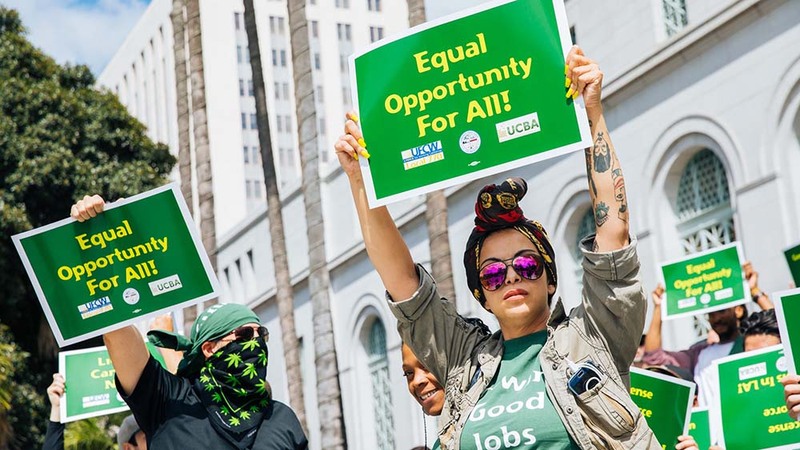 In LA, at least, unions do have a little support from the city’s cannabis ordinance, which stipulates that any business with ten or more employees is required to sign a labor peace agreement. This effectively means the employer will allow a union rep to come in and consult with workers on the possibility of organizing. There’s also been a few notable wins for the UFCW so far, like the establishment of a health insurance trust that can provide cannabis employees with medical coverage, according to Robert Chlala, policy researcher for the UFCW in LA. In addition, some employers do seem to genuinely want to act responsibly, and have even welcomed structured guidance from unions on best practices, organizers said. For decades, there was no formal hierarchy within cannabis collectives, blurring distinctions between employees, managers, and everyone in between, according to Chlala. There was almost a paternalistic relationship in some cases, he noted, in which bosses would engage in unorthodox behavior, like loaning workers their cars or bailing them out of jail. “It’s a very small work environment that you’re dealing with and often there’s really tight relationships between employers and employees that were built during this period of living… under the shadow of the threat of the police,” Chlala told VICE. For Victoria Arana, now 22, being a union member has already reaped benefits. After her prior employer was shuttered, she moved on to work at the longstanding California Caregivers Alliance, also in Silver Lake. Her wages are contracted through the UFCW, she said, providing scheduled raises and a flexible work schedule that allow her go to to school and secure days off when necessary. The union is also poised to serve as a key lever of institutional support for workers like her against the possibility of harassment and other workplace violence.